The Food and Drug Administration this year approved a “cancer vaccine” for prostate cancer called Provenge, so-called because it trains the immune system to attack the patient’s tumors. Most such vaccines focus on a single type of cancer, or are even tailored to individual patients. Ipilimumab, by contrast, is a more general immune booster. It blocks a protein called CTLA-4 that acts as a brake on T cells, the soldiers of the immune system. It is already also being tested against lung and prostate cancer. Still, if a tumor does not elicit a strong immune response to begin with, then just keeping the response going longer would not help much, just as lifting one’s foot from the brake usually will not make a car go faster if the accelerator is not pressed. The accelerator needed is Interluekin-2 (IL-2. 2) massive production of chemoattractants that may recruit other immune cells to the tumors. 3) activation of cytolytic mechanisms in monocytes (calgranulin, grancalcin) and NK cells NKG5, NK4. The take away; systemic combinatorial therapy is one of the best ways to utilize the immune system to induce an immune response to Melanoma Cancer. STAT-3 signaling from the tumors blocks the pro-inflammatory cytokines, so no danger signal is sent to the immune system. 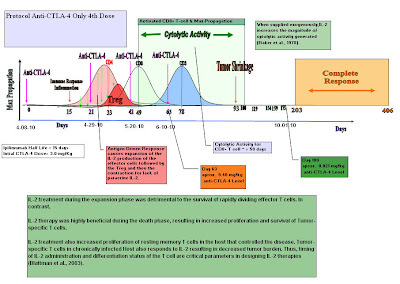 DCs leads to enhanced induction of Th17-1 cells. These data demonstrate the capacity of DCs to induce expansion of polyfunctional IL17-producing T cells in humans, and suggest a role for DCs in the enrichment of Th17-1 cells in the tumor bed. Tumor bed is heavily infiltrated by DCs, which, as shown here, are the most efficient inducers of human Th17 cells. The data supports a model in which Th17 cells are recruited to the tumor bed by Th17-attracting chemokines (eg, CCL20, recently shown to be enriched in the melanoma tumor bed) and activated to a Th17 phenotype locally by tumor-infiltrating DCs. The capacity of DCs to induce Th17 cells may be further enhanced by the uptake of apoptotic tumor cells, as well as inflammatory cytokines (eg, IL1, IL6, TNF) in the tumor bed. 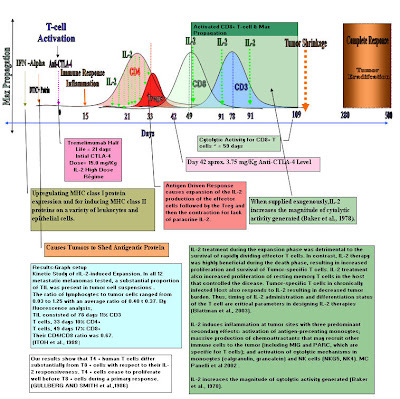 This gives rise to T-cell activation and the inflamed response leading to immune response. For the tumor to survive the immunologic suppression system, it must turn on pathways (such as Stat3) that inhibit production or sensing of proinflammatory danger signals that activate innate and adaptive immune responses. 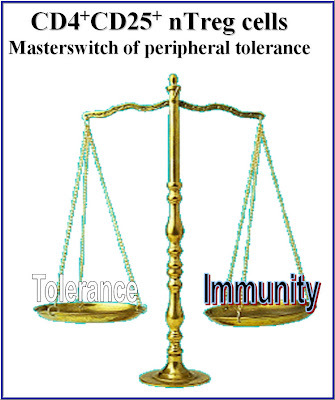 Tumors that successfully accomplish this can shift the balance of immunity from activation to tolerance induction. Pardol et al But what if, the production of Proinflammatory cytokines can over come the suppressive function of the tumor’s microenvironment? Could the differentiation of the CD4+ T-cells into Th17 be the path to activation and immunity responses? If that is the case, then Anti-CTLA-4 blockade (ipilimumab) plays more of a major factor in adaptive immunity then we originally thought. Take away: Get your blood and tumors profiled for Biomarkers. It could lead you to the right therapy to do. Emerging biomarkers potentially useful for the immunotherapy of cancer. Dr. Kirkwood give his honest opinion on the clinical trails to date and where they are heading in the future incliding Biomarkers. Please take an hour out of you day to view and listen, It may save you or your love one from doing the wrong therapy. “It is not the strongest of the species that survives, nor the most intelligent, but the one most responsive to change. First of all thank you for replying to my post. I usually don’t get many replies. 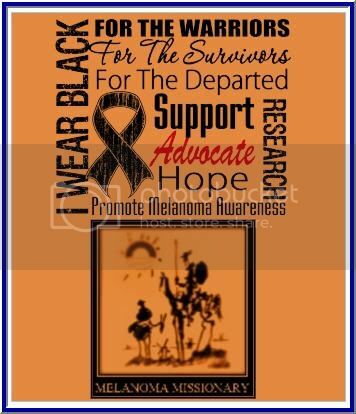 When I talk to my wife about this, within the first five minutes she is telling me “I am loosing her.” It has taken me close to three years to get to where my knowledge on melanoma and the immune system is today. I don’t mean to talk over patient heads. It is just the scientist in me. I worked at Eastman Kodak’s Research laboratories for 25 years. You have said that the most effective durable treatment for advanced melanoma would consist of Ipilimumab combined with IL2 - is that correct? 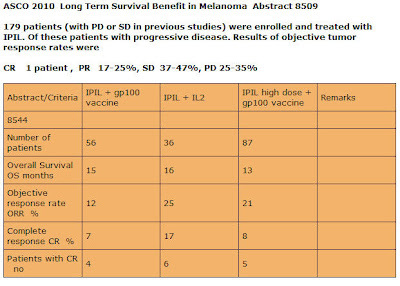 Based on my research today, IL-2 and Anti-CTLA-4 (Ipilimumab) are most durable as we speak. A new phase I therapy is showing great promise with less side effects. 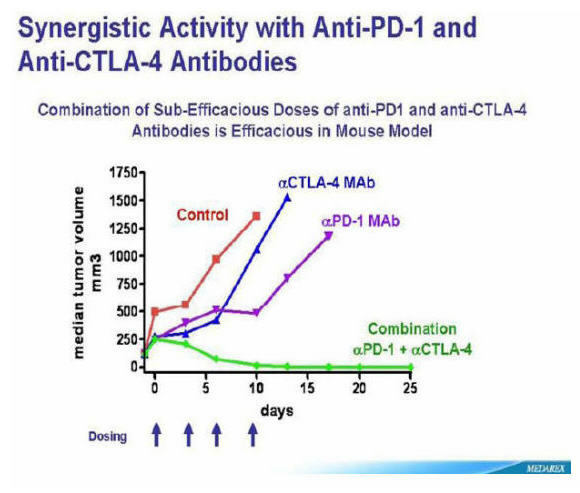 That is anti-PD-1 Therapy. These therapies don’t need a specific HLA type to get into the trials. There is also a very, very ,very new therapy that is still in translational stage. Translational research is a way of thinking about and conducting scientific research to make the results of research applicable to the population under study and is practised in the natural and biological, behavioural, and social sciences. It is usally conduted with animals like rats, mice, monkeys. 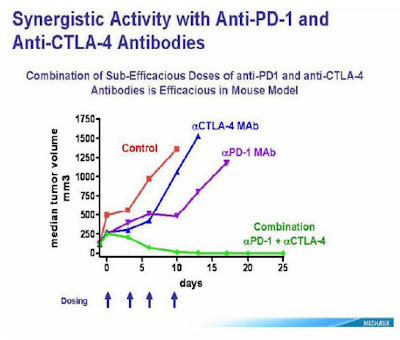 Anyway this therapy combines the Anti-CTLA-4 and Anti-PD-1. It has shown synergistic results. If you have c-Kit or BRAF mutations, then targeted therapy may used but may not be durable. If you are HLA-02 Positive, You have the option of ACT therapy with Dr. Rosenberg or Dr. Patrick Hwu at NCI or MD Anderson. They have gotten 72 % response rate with I think about 36 % complete response is I am not mistaken. 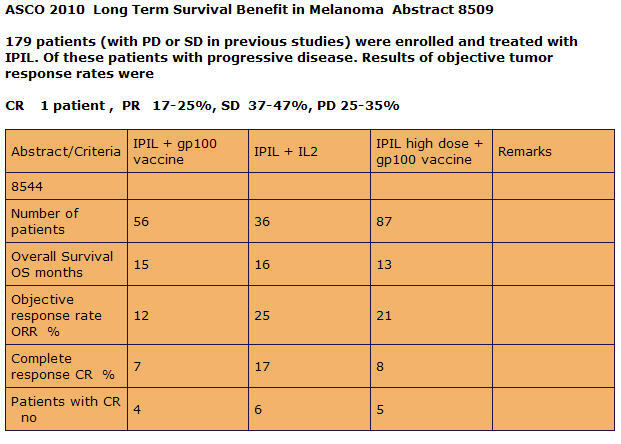 There are no studies currently availble that combine Ipi and IL2, is that correct? Define combine? 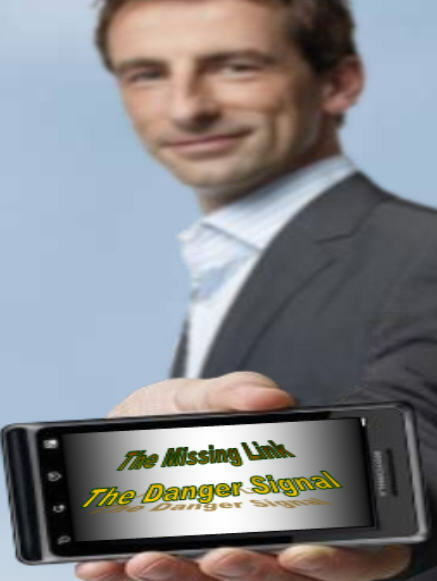 There was a clinical study done by Dr. Rosenberg and colleages. 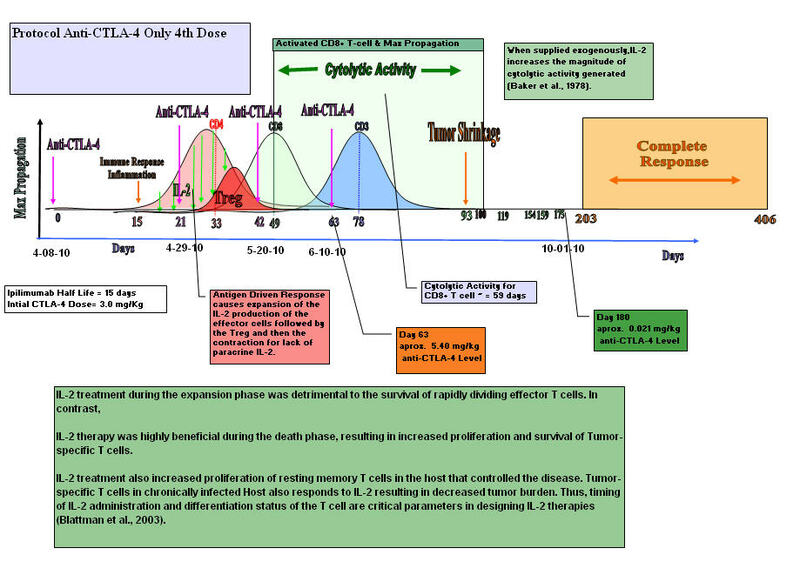 As you can see in the graph above, IL-2 was added prior to the maximum propagation of the CD4+ T helper cells. IL-2 is known as a growth factor. So what I believe happened in this trial, they grew the Tregs. IL-2 treatment during the expansion phase was detrimental to the survival of rapidly dividing effector T cells. In contrast, IL-2 therapy was highly beneficial during the death phase, resulting in increased proliferation and survival of Tumor-specific T cells. IL-2 treatment also increased proliferation of resting memory T cells in the host that controlled the disease. A tumor-specific T cell in chronically infected Host also responds to IL-2 resulting in decreased tumor burden. Thus, timing of IL-2 administration and differentiation status of the T cell are critical parameters in designing IL-2 therapies (Blattman et al., 2003). So what I am trying to say is you do the Ipilimumab therapy first. Wash out for about 50 days, and then start IL-2 Therapy. Take away: It is a systemic combination with dosing and timing involved. Systemic Combinatorial Therapy. to starting IL2 as soon as possible after stopping Ipi? Is there a time frame after which there would be no advantage to having received Ipi prior to taking IL2? Base on papers from ITOH etal and others, 49 days after activation is at the maximum growth phase for the CD8- T-cells that mature into Cytotic T Lymphocytes. Kinetic Study of rIL-2-induced Expansion. In all 12 metastatic melanomas tested, a substantial proportion of TIL was present in tumor cell suspensions. Their CD4/CD8 ratio was 0.67. It was also reported that there is a time factor involved. Is there a time frame after which there would be no advantage to having received Ipi prior to taking IL2? Yes, Ipilimumab has a half life of 15 days. So say you get one dose at 3.0 mg/Kg. It gets more complicated when you get multiple doses. Four dose regiment. I am not sure where the limited threshold is but, at day 49 you have close to the maximum concentration of Ipilimumab in your body. If I had to venture an educational guess, I would say after a four dose regime, you have 75 days to do the HD IL-2. 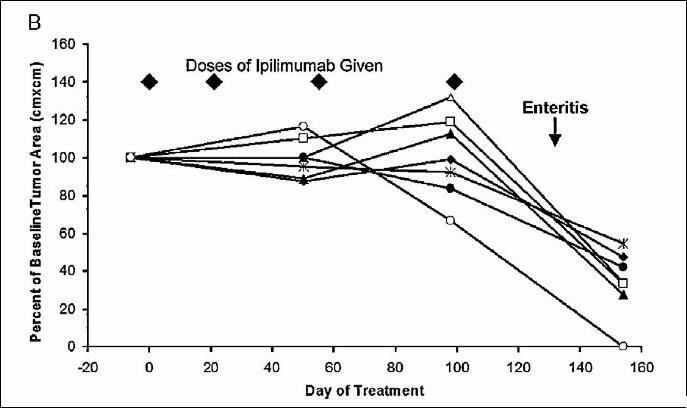 To back this theory up, we will use a chart from Dr. Wolchok experience the Ipilimumab. 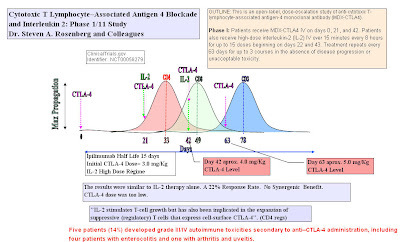 It is a chart with the Absolute Lymphocyte count. (ALC). It is the CD4+ T-cells and CD8+ T cells combined. As you can see from the graph, the maximum ALC was about week 7. Week seven correlates to 49 days. That is when CD8+ T cells are at their maximum growth. Last, is there any evidence that IL2's efficacy is enhanced by combining it with other agents (i.e. Biochemotherapy), either with or without first receiving Ipi? This my take on the situation. 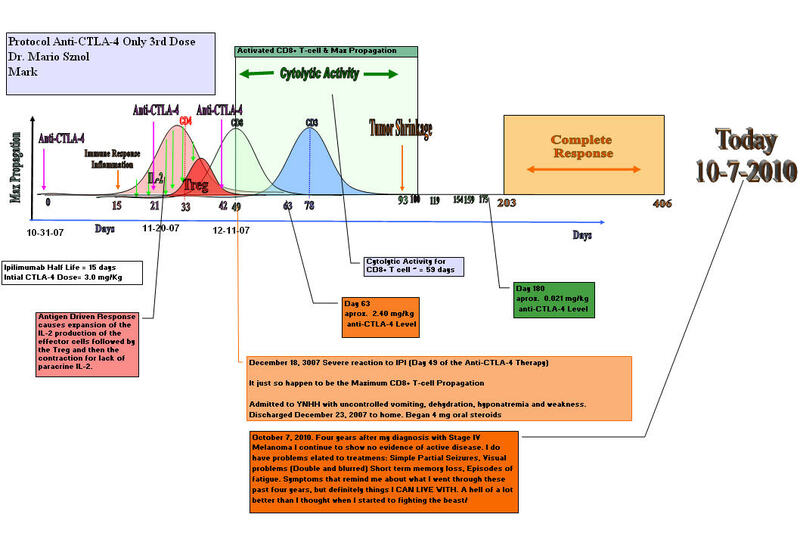 You need the tumor-specific antigen to presented to the T-cells as signal 1. That could be a vaccine, radiation therapy or chemo to shed the antigen. Secondly you need the costimulation of the CD28/B7 interface. 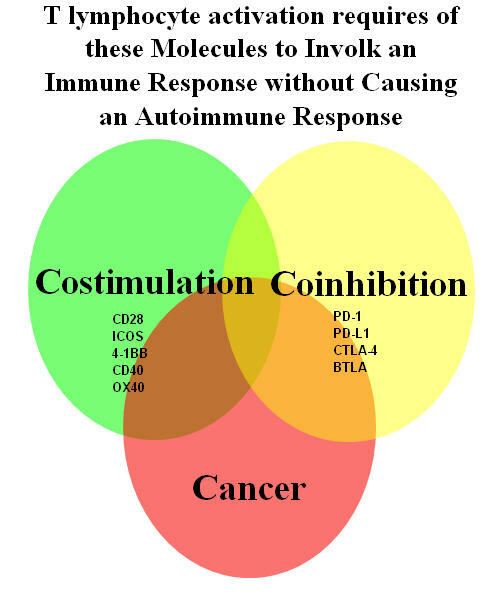 By using Ipilimumab that blocks the CTLA-4 receptor from binding to the B7 molecule and shutting down the response. Anti-CTLA-4 (ipilimumab) also blocks the CTLA-4 receptor on the Treg cells subduing their surpress function. Third you need a “Danger Signal” to get the cell to migrate to the tumor site. 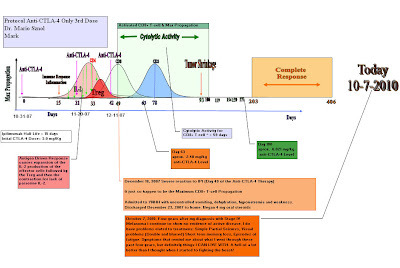 This may be done with inflammatory Cytokines like IL2, IL17, IL-1,IL-12,IFN gamma that act directly on the T-cells. 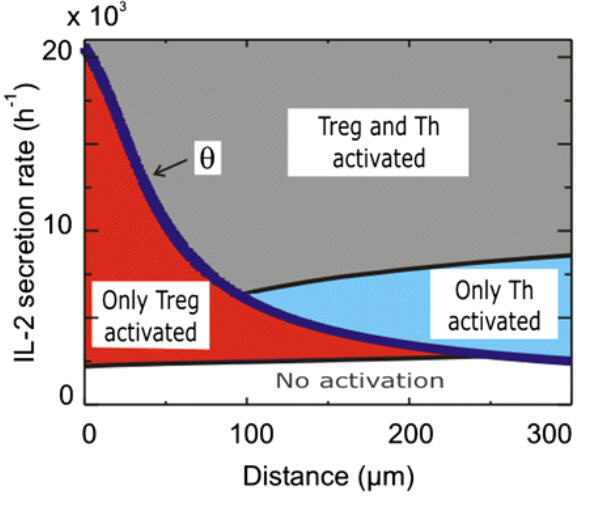 This signal was found to optimally activate the Th1 differentiation and lead to the clonal expansion of the T-cells. It has come to light recently that Ipilimumab helps also in the differentiation by tilting the balance towards Th17 cells. These cells secrete IL-17 which recruite the neutrophils. This all takes place at the tumor’s microenviroment. The neutrophils secrete chemokines that are chemoattractants. These chemokines, MIP-1alpha, MIP-1beta, and MCP-1 are recently reported to serve as chemoattractants for Th1 cells. MIP-1alpha and MCP-1 are also reported to enhance antigen-specific (CTL) Cytotoxic T Lymphocyte induction. Studies revealed that MIP-1alpha /beta released from neutrophils are involved in recruitment of macrophages, T cells, monocytes, dendritic cells (DC), neutrophils and NK cells. MIP-1 attracts predominantly CD8+ T cells while MIP-1 attracts CD4+ cells, although there is some overlap between subsets in response to both chemokines. The other Chemokine MCP-1, binds to CCR2 to accumulate monocytes/macrophages, DC, T cells, and NK cells, thereby playing an important role in innate and adaptive immunity. CCR2 is Chemokine receptor that is key determinant of leucocyte trafficking. IL-2 strongly upregulates expression of CCR2. With the MCP-1/CCR2 interface, the cells can traffic towards the tumor’s microenvironment. The trafficking of the cells and inflammatory cytokines present the perfect storm in the tumor’s microenvironment to induce the right immune response to eradicate the cancer, Melanoma. So to answer your question, is there any evidence that IL2's efficacy is enhanced by combining it with other agents (i.e. Biochemotherapy), either with or without first receiving Ipi? yes if you know and take a systemic approach. You need to activate the t-cells before introducing IL-2. IL-2 can be the activator for small patient population. 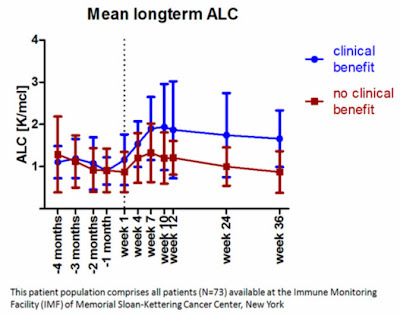 As for Ipilimumab going it alone, like IL-2 can be the activator for small patient population. 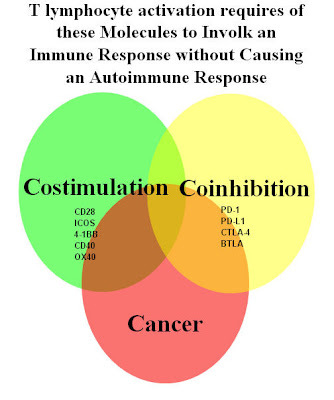 But when you do a systematic combinatorial therapy, there can be a synergetic result, complete response. I hope I answered you questions, and please don’t hesitate to ask them. I do all this time by requesting reseach papers from around the world. Each question is a learning tool. There are no stupid questions. Knowledge is power to make an educated decision. Your Life may depend on it. There are many paths to take. Just follow the yellow brick road to complete response. A race for a cure!!!!!!! Let the games begin!!!!! WHATScientists at the National Institutes of Health have redefined the roles of several cytokines involved in the generation of immune cells implicated in severe autoimmune diseases. The study in mice showed that development of Th17 immune cells can occur without the presence of transforming growth factor (TGF)-beta, a mediator thought to be required for Th17 cell development. 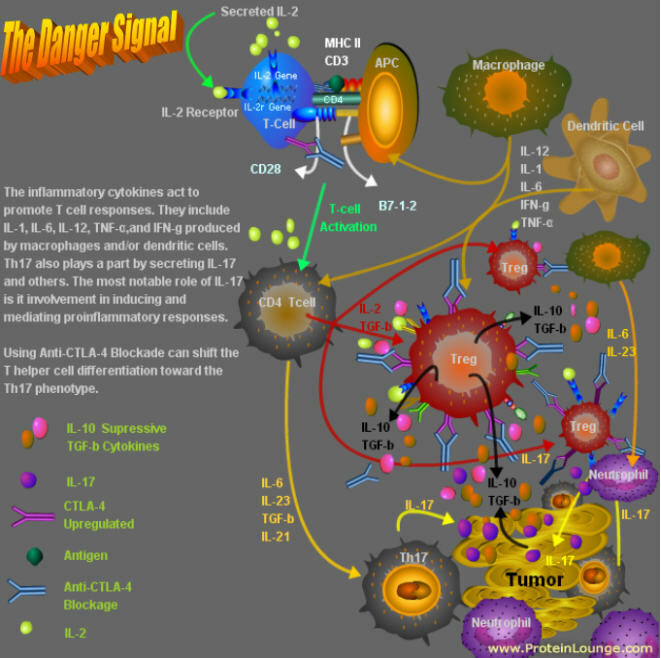 The study demonstrates that the interaction of three inflammatory cytokines (proteins that influence the behavior of cells) - interleukin-6 (IL-6), IL-1-beta and IL-23 - is responsible for the creation of Th17 cells that are more active in promoting autoimmunity than Th17 cells generated with IL-6, IL-1-beta and TGF-beta. These findings reemphasize the separate roles of IL-23 and TGF-beta in immunity and autoimmunity, and open up possibilities for the development of new therapies. The study appears in the current issue of the journal Nature. The immune systems of mice and humans mainly consist of B cells and T cells. 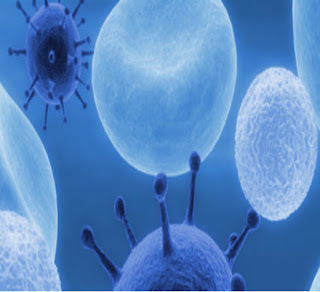 While B cells fight infections and can induce autoimmunity by producing antibodies that directly target foreign antigens or a person's own tissue, T cells are involved in overall cell-mediated immunity. Importantly, how a T helper (Th) cell differentiates (develops from an immature, unspecialized cell into a mature, specialized cell) determines how it mediates immune responses. 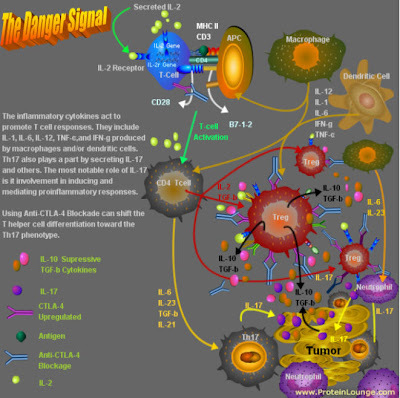 Th17 cells produce IL-17, a powerful inflammatory cytokine, and have been implicated in multiple autoimmune diseases, including rheumatoid arthritis, psoriasis and multiple sclerosis. The established belief has been that Th17 cells initially differentiate in response to activation by IL-6 and TGF-beta. However, previous research has shown that TGF-beta is primarily associated with suppressing immune functions and promoting regulatory T cells (Treg), which can produce inhibitory cytokines that dampen inflammatory immune responses. In the present study, the NIH scientists first looked at the conditions to differentiate Th17 cells from naïve T cells outside of the mouse (in vitro) and tried several different cocktails of cytokines to see which combinations would promote Th17 development. They found two combinations that efficiently induced Th17 differentiation. As previously described, IL-6, IL-1-beta, and TGF-beta-1 together created Th17 cells. Surprisingly, IL-6, IL-1-beta, and IL-23 without TGF-beta also created Th17 cells. Most interestingly, the action of Th17 cells generated with IL-23, designated Th17(23), was different from the action of Th17 cells generated with TGF-beta (Th17(beta)). The researchers compared transcription factors, receptors and mediators of the two Th17 subtypes and looked at the pathogenic activity of both Th17 subtypes in mice during experimental autoimmune encephalomyelitis (EAE), a common model of autoimmunity that mimics some aspects of multiple sclerosis. 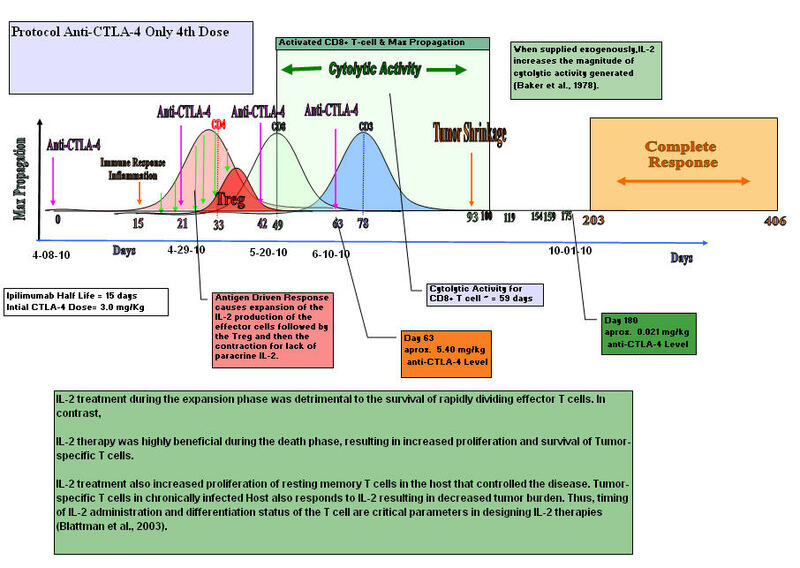 They found that Th17(23) cells provoked significantly more severe disease than did Th17(beta) cells. These findings suggest a new model for Th17 generation and the existence of functionally different subtypes of Th17 cells. This study also provides a better understanding of the array of immune components involved in autoimmunity and suggests possibilities for new targeted therapies. NIH scientists contributing to this study are affiliated with the National Institute of Arthritis and Musculoskeletal and Skin Diseases (NIAMS), the National Institute of Dental and Craniofacial Research (NIDCR), and the National Institute of Allergy and Infectious Diseases (NIAID). Additional support was provided by Merck Research Laboratories (Schering-Plough Biopharma), Palo Alto, Calif.
Ghoreschi K, Laurence A, Yang XP, Tato CM, McGeachy MJ, Konkel J, Ramos HL, Wei L, Davidson T, Bouladoux N, Grainger J, Chen Q, Kanno Y, Watford WT, Sun HW, Eberl G, Shevach E, Belkaid Y, Cua DJ, Chen W, O'Shea JJ. Enhanced Pathogenicity of Th17 cells Generated in the Absence of Transforming Growth Factor-ß Signaling. Nature. 2010 October 21;467(7318): 967-971. John J. O'Shea, M.D. Scientific Director, National Institute of Arthritis and Musculoskeletal and Skin Diseases, is available to comment on this article. To schedule interviews, please contact Trish Reynolds, 301-496-8190, . The mission of the National Institute of Arthritis and Musculoskeletal and Skin Diseases (NIAMS), a part of the Department of Health and Human Services' National Institutes of Health (NIH), is to support research into the causes, treatment, and prevention of arthritis and musculoskeletal and skin diseases; the training of basic and clinical scientists to carry out this research; and the dissemination of information on research progress in these diseases. For more information, visit http://www.niams.nih.gov. The National Institute of Dental and Craniofacial Research (NIDCR) is the Nation's leading funder of research on oral, dental, and craniofacial health. For more information, visit http://www.nidcr.nih.gov/. The National Institute of Allergy and Infectious Diseases (NIAID) conducts and supports research -- at NIH, throughout the United States, and worldwide -- to study the causes of infectious and immune-mediated diseases, and to develop better means of preventing, diagnosing and treating these illnesses. For more information, visit http://www.niaid.nih.gov. The National Institutes of Health (NIH) -- The Nation's Medical Research Agency -- includes 27 Institutes and Centers and is a component of the U.S. Department of Health and Human Services. It is the primary federal agency for conducting and supporting basic, clinical and translational medical research, and it investigates the causes, treatments, and cures for both common and rare diseases. For more information, visit www.nih.gov. Three major events must occur to induce CD8+ T cell–mediated, tumor-protective immunity against melanoma. First, the T-cell receptor must be triggered by a (or multiple) self antigen–derived peptide MHC class I complex. Therefore, this event depends entirely on appropriate antigen presentation, which is most efficiently provided by mature dendritic cells. 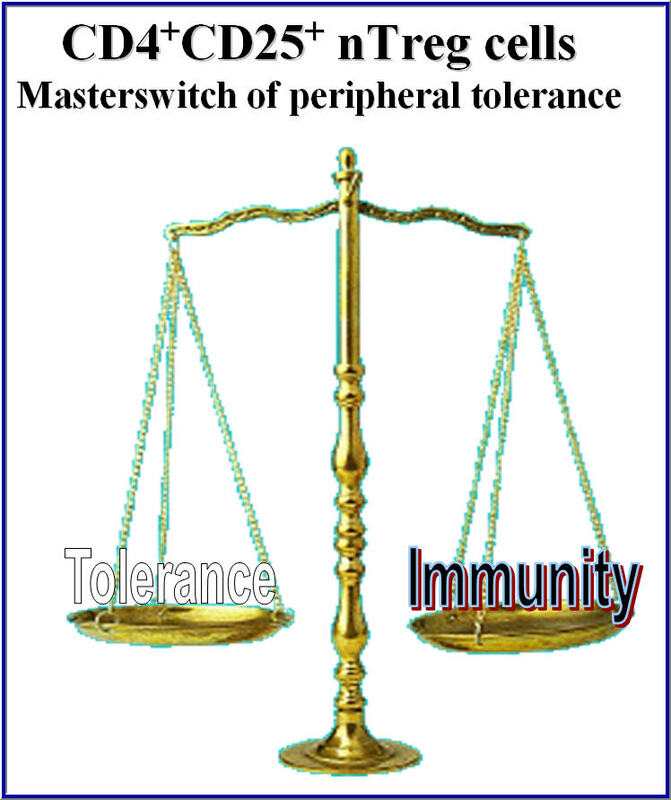 Peripherally tolerant or “ignorant” self-reactive T-cell clones, once properly activated, may serve as tumor-specific effector T cells. Second, simultaneously with T-cell receptor triggering, a distinct second costimulatory signal must be delivered, mediated by IL-2, B7-1, or B7-2, which engage IL-2 receptors and CD28 on the surface of the T cell, respectively (17). A source of these cofactors for effective CD8+ T-cell stimulation can be provided by CD4+ T cells that release critical amounts of IL-2, or by mature dendritic cells that display an increased level of B7-1/B7-2 costimulatory molecules on their cell surfaces. 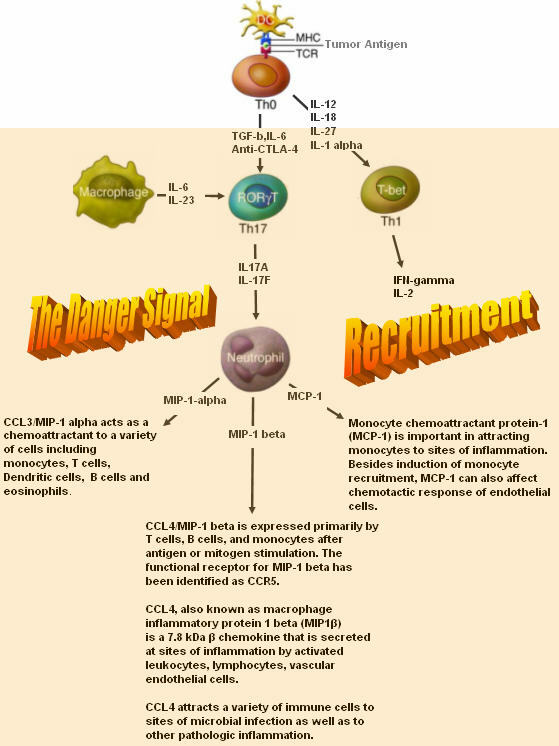 The inflammatory cytokines act to promote T cell responses. They include IL-1, IL-6, IL-12, TNF-α, and IFN-g produced by macrophages and/or dendritic cells. 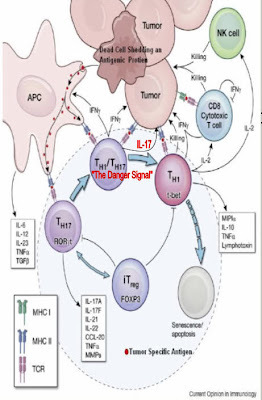 Th17 cells also plays a part by secreting IL-17 and others. The most notable role of IL-17 is it involvement in inducing and mediating proinflammatory responses. Neutrophils are the earliest cells to arrive at the inflammatory site. to promote the recruitment of monocytes and neutrophils via the induction of other cytokines and chemokines such as G-CSF and IL-8 by various cell types. IL-17 appears to be involved in promoting neutrophil influx into the tumor site. With the influx of neutrophils in the tumor’s microenvironment and the inflammatory cytokines, capillaries at the melanoma tumor’s microenvironment become dilated, making room for the recruitment of immune cells. Neutrophils also play an important role in promoting or suppressing the Th1 immune response, which is mediated partly by induction of cytokines or chemokines. Depending on the compositional makeup of the microenvironment, the neutrophils can promote the right immune response. Studies revealed that these neutrophils secreted three different chemokines. Some of these chemokines are known as chemoattractants. A chemoattractant is a chemical (chemotactic) agent that induces an organism or a cell, a leukocyte, to migrate toward. The combination of chemoattractants and inflammatory cytokines, in the tumor’s microenvironment, helps to send out a Danger Signal which in turn invokes the right immune response to eradicate the Melanoma tumors. trafficking of activated cells to sites of effector function, and the migration of such effector cells within peripheral tissues. To gain a more detailed appreciation of the dynamics of such cell behavior and the relationship between cell dynamics and function, I have put together a series of events that take place during the activation phase of the immune response. We know based on research that once the CD4+ T cell is activated, within two hours the IL-2 expression and IL-2 receptor are unregulated. IL-2 is secreted 45 minutes into this activation phase. Experimental work has shown that IL-2 signaling in the first 10 hours is critical for the proliferation decision of T cells in culture. The spacial resolution of the Tregs and the T helper cells during this phase plays a major part in the immune response. Secreted IL-2 is competed for by the Tregs and the activated CD4+ and CD8+ T-cells. If the Tregs are in close proximity of the T effector cells that are secreting the IL-2, the Tregs will create an IL-2 sink in the microenvironment. This will cause the proliferation and survival of the Tregs which suppresses the effector cell function. The IL-2 sink is where all the IL-2 that is secreted by the T helper cells is adsorbed by the IL-2 receptors on the Treg cells. 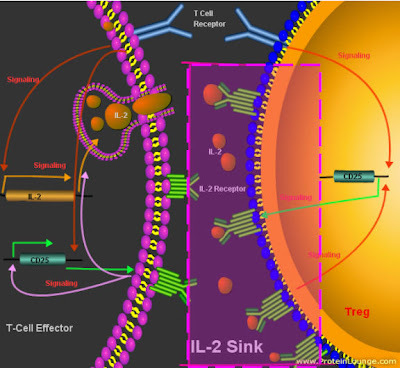 Tregs don’t have the capability to produce IL-2 so they must scavenge the IL-2 out of the microenvironment of the CD4+ T helper cells. In Treg cells, the IL-2 gene is silenced and IL-2Rα is constitutively expressed through the action of the Treg-lineage-specifying transcription factor FoxP3. The model proposed by Dr. Dorothea Busse and colleages predicts that the IL-2 secretion rate must exceed a threshold value Theta (θ) to switch IL-2Rα expression to the activated state and permit extensive autocrine IL-2 signaling. This is just like the three little bears. 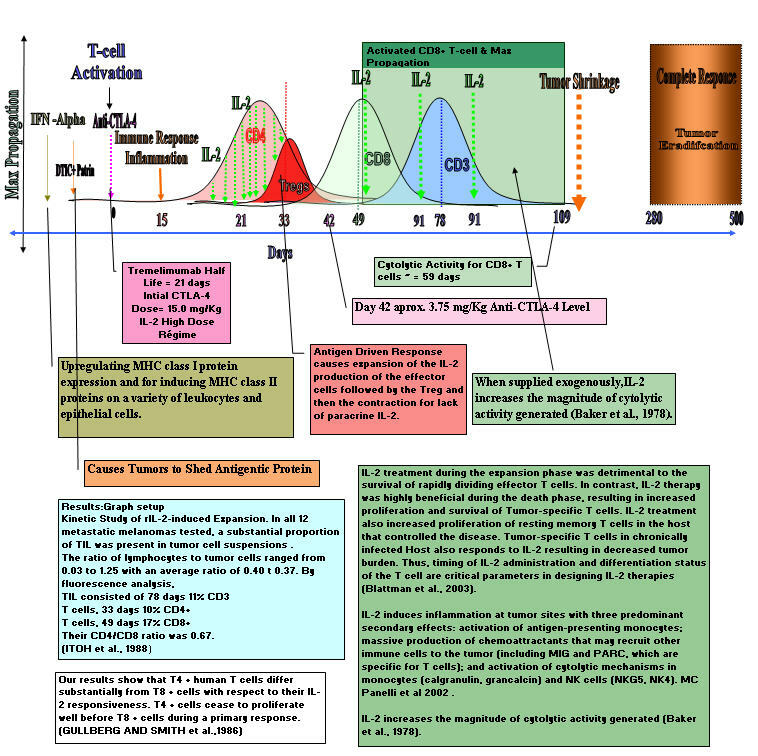 You need the microenviroment conditions just right to activate T Helper cells. As you can see in the above diagram, you don’t need high concentration of IL-2, you need spacial distance from one cell to the other. That can be achieved by Anti-CTLA-4 Blockage. By blocking the CTLA-4 receptors, the spacial distance between the T helper cell and the Treg cells increases and it also helps to differentiate the niave CD4+ T cells into Th17 cells. IL-2 is mainly captured by the Treg cell, whereas autocrine reuptake by the T helper cells predominates when the cells are further apart. 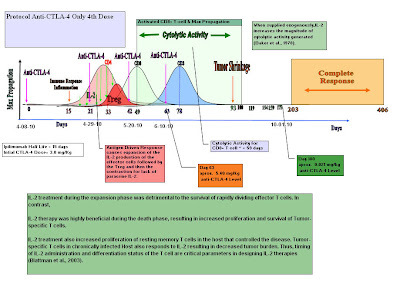 So we want to introduce IL-2 before the tumor recruites the Tregs to the Tumor Microenviroment and or when the Treg population is in the contration phase of the CD4+ T-cell cycle. number and surface receptor (IL-2R) number per cell. Ligand n. An ion, a molecule, or a molecular group that binds to another chemical entity to form a larger complex. Suboptimal amounts of IL-2 during priming promoted apoptosis, little proliferation and cell cycling, yet the CD8+ effectors generated produced high levels of cytokines and proliferated autonomously. Although IL-2 deprivation caused apoptosis and little proliferation initially, the effectors generated under these conditions possessed optimal effector functions. This low IL-2 concentration, allows the T help cell to activate and proliferate. This is the reason why it takes a while for the tumors to begin to shrink because of little proliferation at first. It takes time for the immune system to assemble an army of Cytotoxic T Lymphocytes. So how can we minimize the proliferation of the Tregs which are a subset of CD4+ T-cell subset without doing a full blown depletion of the CD4+ T-cells? 4. A combination of the above three. This is the future of Melanoma Therapy, Combinatorial Therapy. 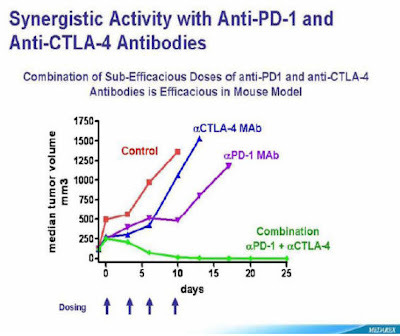 As you can see the combinatorial therapy of Anti-CTLA-4 and Interluekin-2 give the best complete response. I am convince that if they adjust the timing and dose, they will see an even higher response rate in overall survival. The paper that I am about to present to you is a culmination of research that was done base on my own experience as a stage IV Melanoma Patient. I wanted to know why my immune system responded and prove to myself and my doctors that it was not a statistical fluke. I dedicate this paper to all my fellow Melanoma Patients that lost their battle with the Beast, especially Bob Luker who fought so bravely but was unable to obtain Anti-CTLA-4 blockade due to the shortage proclaimed by Bristol Myer Squibb which halted compassionate drug use on 9-12-2008. Most Melanoma tumors are accepted by the host’s immune system and progress even when they contain potentially antigenic proteins. This may be due to the tumor secreting immunosuppressive Cytokines like, TGF-Beta, IL-10, IL-4 and IL-6. 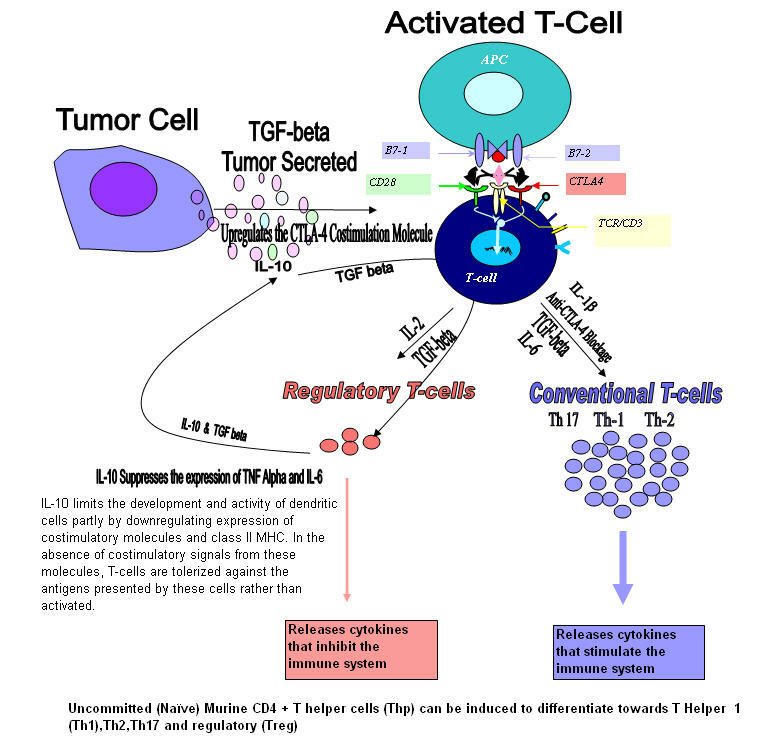 TGF-β inhibits the proliferation and functional differentiation of T lymphocytes. TGF- Beta accelerates the expression of CTLA-4 by stimulated CD4+CD25– T cells. 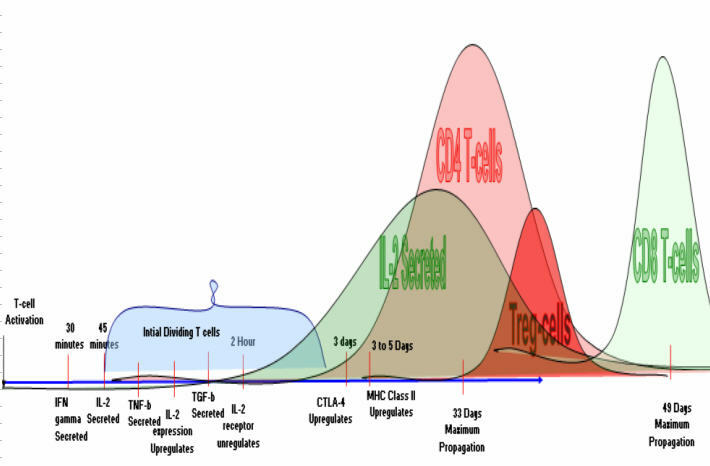 TGF- Beta requires CTLA-4 early after T Cell Activation to induce FoxP3 and generates adaptive CD4+CD25+ (Treg) Regulatory Cells. The tumor cells secrete TGF-Beta. February, 2003 my wife noticed a dark spot on my balding head. April 2003 Punch biopsy read asmelanoma, 0.76mm deep. Oct 2003 - University of Pennsylvania Pigmented Lesion clinic in Philadelphia they reread my slides and reclassified it to a Breslow's depth of 0.86 and Clark's level 4 and told me I have Stage 1B with a specific note that there appeared to be no immunologic response by my body to the melanoma. October 2003 - October 2006 Derm exam every 3 months. Many dysplastic nevi excised. Doing well, no more primaries, no problems. October 2006 coughed up blood CT, PET showed a 5cm mass in my L lung. MRI negative for brain mets. No other lesions found. 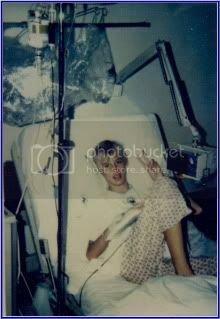 October 30, 2006 - Thoracotomy at St. Peter's Hospital in Albany NY with removal of the lower lobe of my left lung. Did well after surgery. December 12, 2006 - Had MRI and CT for study and found I has a previously undiagnosed. December 14, 2006 - Neurosurgeon says "take it out"
October 31, 2007 First dose of Ipilimumab at Yale-New Haven Hospital. Admitted to YNHH with uncontrolled vomiting, dehydration, hyponatremia and weakness. Discharged December 23, 2007 to home. Began 4 mg oral steroids. February 4th…Have lost all peripheral vision. Wheelchair and walker. MRI noted area of increased swelling on right parietal lobe at site of June 2007 surgery. Not metastatic disease. April 2008 prescribed high dose (40mg) oral steroids to reduce swelling and manage side effects until planned surgery May 2008. May 8 2008 planned craniotomy (#3) to remove necrotic tissue iAfter 5 day inpatient stay, walked out of hospital without assistive device. Began taper of steroids. May-June 2008 unable to tolerate steep taper, steroids increased and taper resequenced at much slower rate. December 2009 Tumors still visible on scans in brain and lungs but no growth since 2008, Stable. No evidence of active disease. 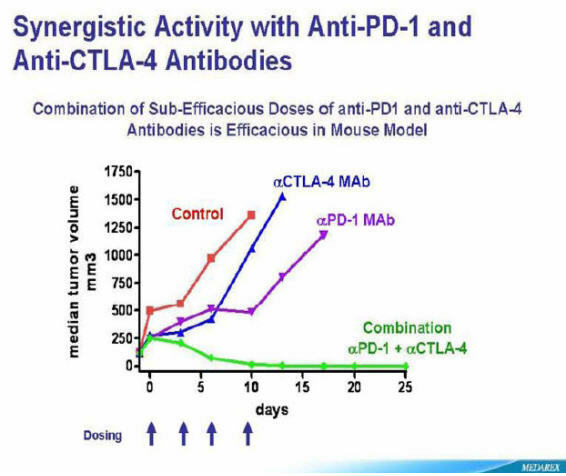 Was it the combination Radiation, IL-2 plus the Anti-CTLA-4 blockage? • Immunotherapy has yet to fulfil its clinical potential. • Historically, responses have only been observed in a minority of patients. • Recent trials of new immunotherapies in oncology have shown that patients receiving treatments such as anti-CTLA-4 therapy respond differently, and sometimes later, compared with those receiving chemotherapy or some of the existing immunotherapies such as interleukin-2 and interferon. Some of the investigational immunotherapies act as T-cell mediated immunopotentiators. That is, they may regulate and potentially enhance the body’s own immune response, and consequently there may be a delay in stimulating the immune system to fight disease. en•ter•i•tis ( n t -r t s). n. Inflammation of the intestinal tract. Inflammation is the "Danger Signal" that is needed to hone in on the cancer itself. Currently it is difficult to select patients who might benefit from specific immunotherapeutic approaches, and tailored immunotherapy regimens will have to be created in order to provide the most appropriate and effective treatment. Each Patient is at a different stage of his or her disease. It will take a trained Melanoma Oncologist to provide the guidance. T-cell activation video from Andrew Lamb on Vimeo. Cancer manages to suppress or elude the body's immune system to survive and grow. Scientists at The University of Texas M. D. Anderson Cancer Center show this week in the journal Immunity how the helper T cell Th17 awakens the immune system to attack cancer. Senior author Chen Dong discusses the findings and their potential application for patients. An important mechanism by which Melanoma cancer avoids antitumor immunity is by recruiting regulatory T cells (Tregs) to the tumor microenvironment. Recent studies suggest that suppressor Tregs and effector Th17 cells share a common lineage and differentiate based on the presence of certain cytokines in the microenvironment. 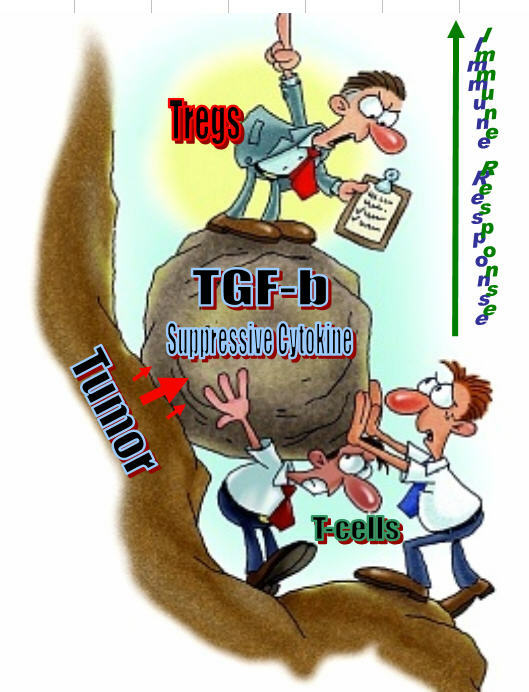 Because IL-6 in the presence of TGF-β has been shown to inhibit Treg development and induce Th17 cells, they hypothesized that altering the tumor cytokine environment could induce Th17 and reverse tumor-associated immune suppression. CTLA-4–B7 Interaction on the activated T-cell suppresses Th17 Cell Differentiation.Using anti-CTLA4 blocking antibody (Ipilimumab or tremelimumab) increases Th17 cells in peripheral blood of patients with metastatic melanoma. The Th17 cells can then migrate to the tumor's microenviroment. 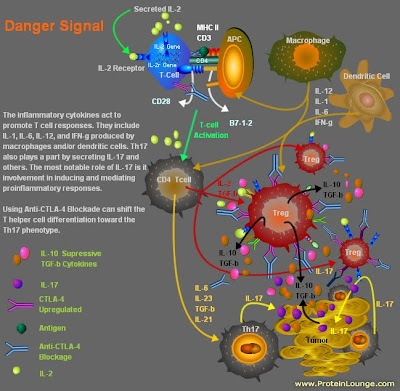 This sends the Danger Signal in the form of pro-inflammatory cytokines including IL-17. This is the third signal that is needed in the initiating of an immune response. 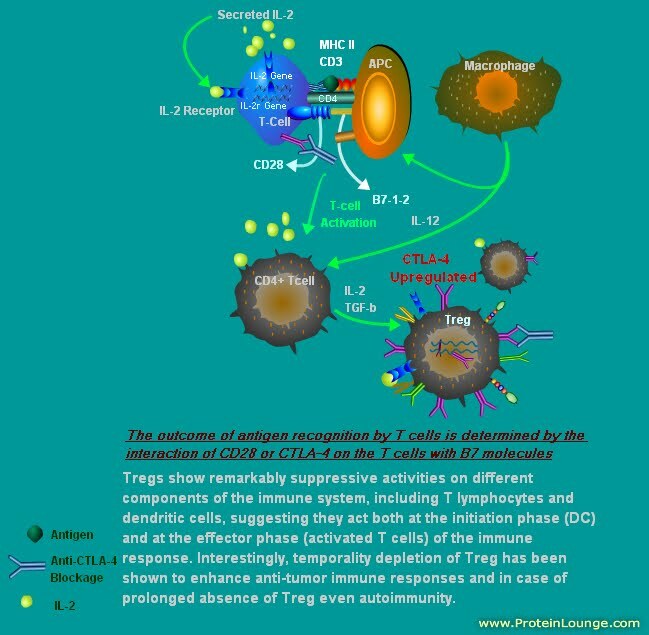 One of the mechanisms proposed is that CTLA-4 inhibition of T cell activation is due to antagonism of CD28-mediated costimulation. Both CD28 and CTLA-4 share the ligands B7.1 (CD80) and B7.2 (CD86); however, the affinity of the CTLA-4:B7 interaction is 10 times higher than the affinity of the CD28:B7 interaction. Although studies using CD28-deficient mice have shown that negative signaling through CTLA-4 is independent of CD28 expression, it is plausible that CTLA-4 interacts with B7 and prevents its interaction with CD28. 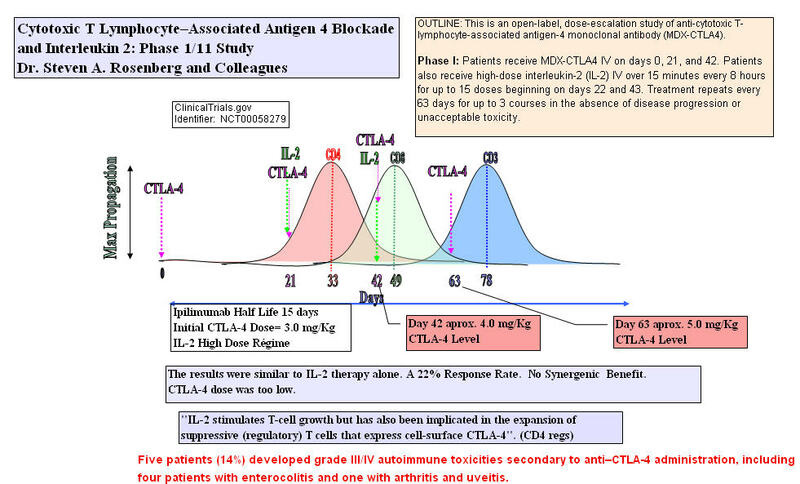 It is possible that T-cell activation can’t start until the level of CTLA-4 is block or decreased. If you Block the CTLA-4 and B7 with Ipilimumab or tremelimumab It will also take the brakes off the immune system and shift it towards activation. I hypothesized that Th17 cells induce Th1-type chemokines, and in turn recruit Th1-type effector T cells into tumor microenvironment. 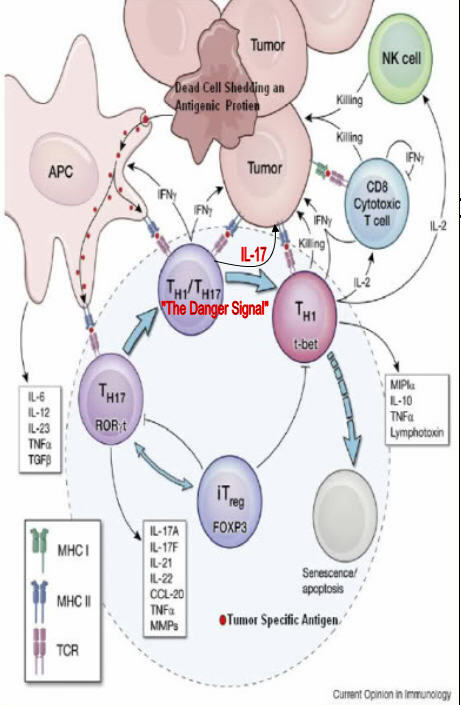 Recent data supports the notion that Th17 cells induce Th1-type chemokines through IL-17 and IFN- , and in turn recruit Th1-type effector T cells and NK cells into tumor microenvironment. Mechanistically, Th17 cell–derived IL-17 and IFN- synergistically induced the production of CXCL9 and CXCL10, and in turn promoted effector T-cell migration toward tumor. The levels of CXCL9 and CXCL10 were directly correlated with tumor-infiltrating CD8+ T cells and NK cells. The data suggest that Th17 cells may play a role in promoting effector T-cell and NK-cell tumor trafficking and retainment, and the polyfuctional cytokine profile (IFN- +IL-17+) of Th17 cells is essential for synergistically inducing Th1-type chemokines. The first step is to relieve the immune system from the tumor-dependent immune tolerance mediated by Treg, which prevents the development of an efficient antitumor immune response. The second step is the activation of the immune response.